Following the Second World War, Britain had an urgent need for housing, and traditional building materials and skilled labor were in short supply. In order for inexpensive and easily erected properties to be installed, component parts made of cast concrete were produced in factories and then sent out to be erected by labor who were untrained in traditional construction skills. One style of house was called Unity housing. About 15,000 Unity homes were built in the 1950's, mostly as semi detached and terraced houses. They were factory produced and assembled on site with precast reinforced concrete columns. They had pre-fabricated kitchens and bathrooms and were situated in excellent locations with roomy accommodations and sizable yards. This type of structure makes me think of Number 4 Privet Drive and the Bucket residence (Chez Bouquet). 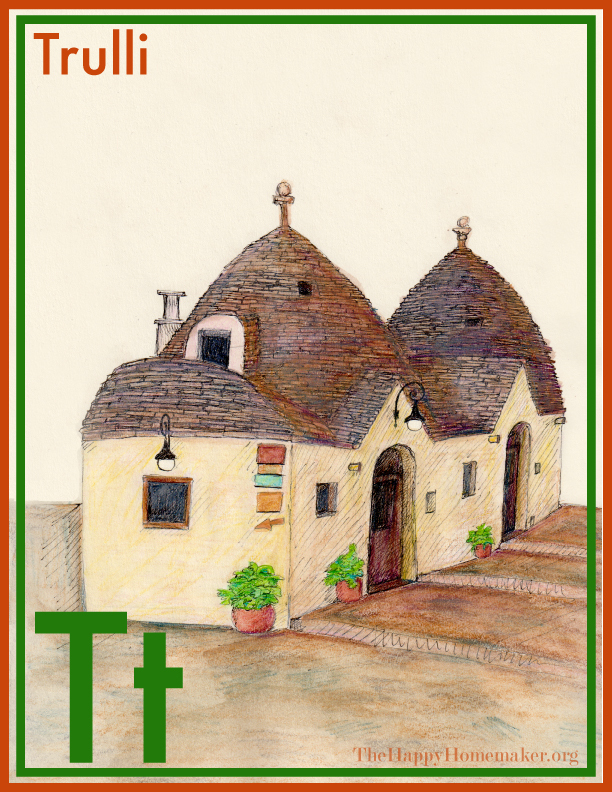 A trullo is a traditional Apulian stone dwelling of the Italian Itria Valley. 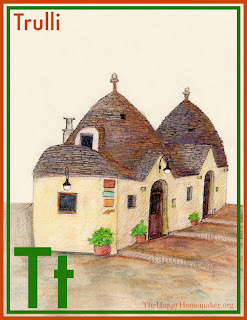 Similar to the French orri in their dry-stone conical roof structure, trulli traditionally were built without any mortar. In addition to its unique architecture, the Itria Valley is famous for its annual summer opera festival. Where do I sign up? 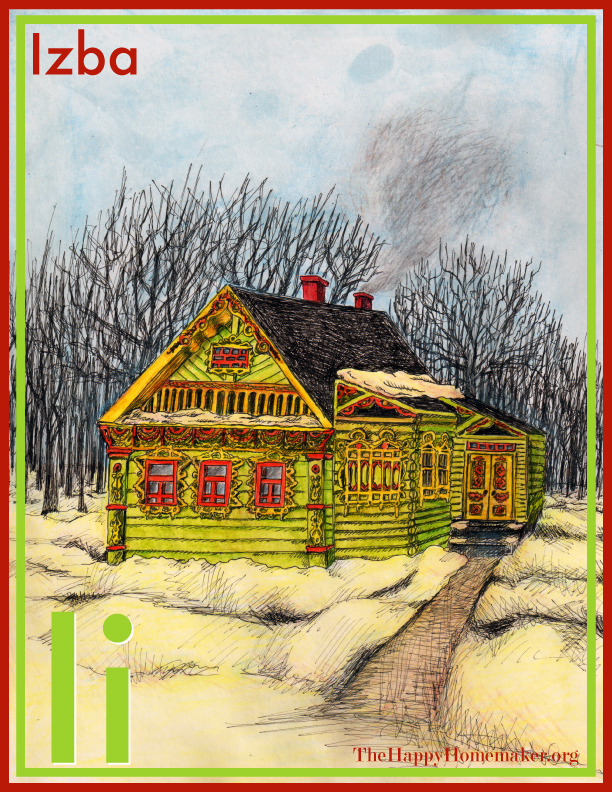 Let me get one thing out of the way at the start: there are a lot of different houses built and used by the Sámi people, who are a culturally connected people spread across many different political lines in far northern Europe. The Sámi live in the northernmost parts of the countries of Norway, Sweden, Finland, and Russia. 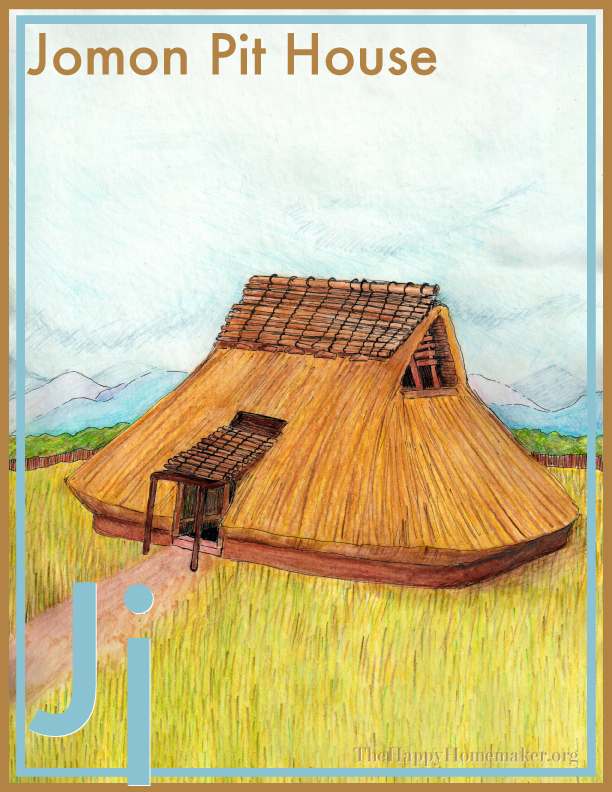 I illustrated a Sámi house traditionally found in Sweden for this house because I love the house's supports, but there are many, many fascinating Sámi dwellings that could take up their own sub-project, and believe me, I'm thinking about it. I am really fascinated by the Sámi, and I want to learn loads more about them. I will keep you posted! Rondavels are found throughout southern Africa including South Africa, Lesotho, Swaziland, and Botswana. The structure of a rondavel is pretty amazing because the roof has no struts or beams supporting it and is built without internal braces. 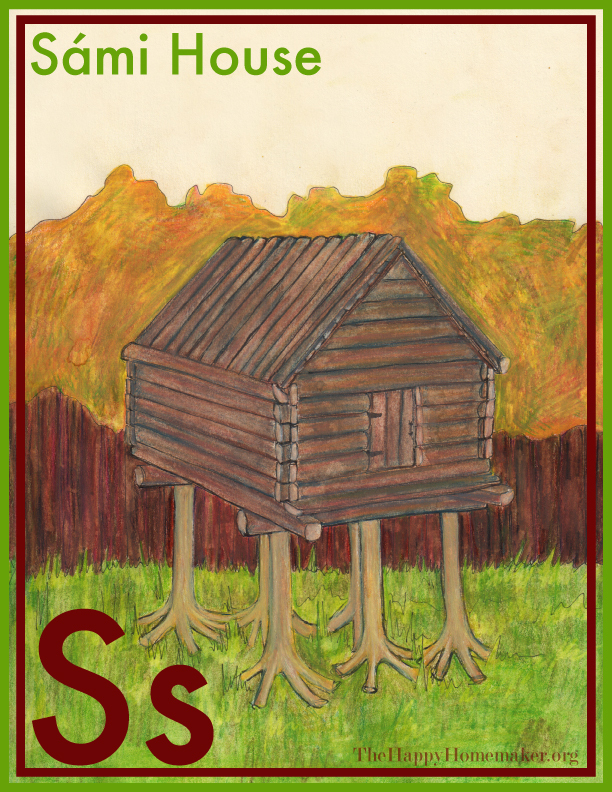 There are no seams, joists, or rafters up there, like there are in a gabled roof. 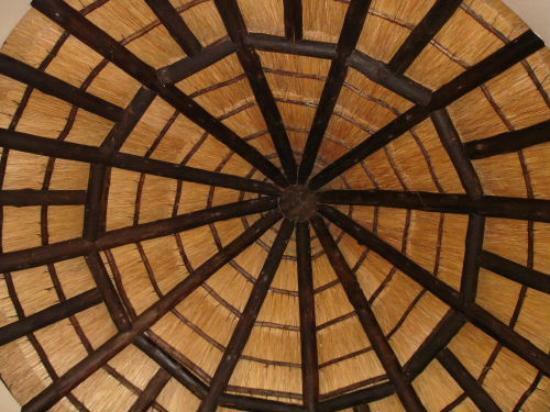 The roof is thatched over wooden poles made of tree limbs and sewn with grass rope. Traditionally, the floors and walls of these roundhouses are fortified with a processed mortar made of earth, sand, and dung that strengthens the earthen floor and stone walls with a firm and smooth coating. The houses are not just green and sustainable, they are beautiful too. The exterior of the walls are oftentimes decorated with carvings, paintings, and mosaics. 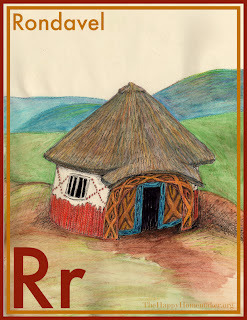 Verified information of rondavels is not as prevalent as other house types that I have been researching, but the essay by Gerald Steyn, The Indigenous Rondavel – a Case for Conservation, has an excellent bibliography that got me started. 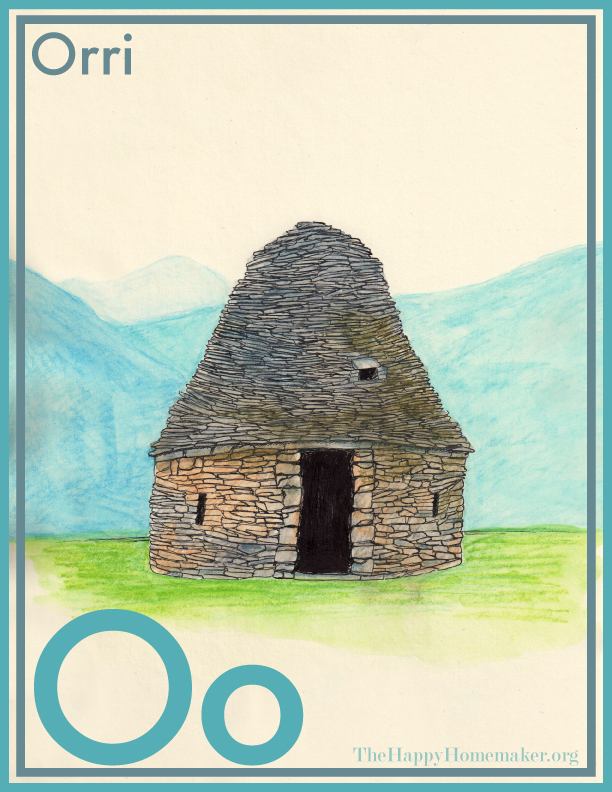 A quinzhee, for those who are unfamiliar, is also known as a snow hut, cave, or shelter. 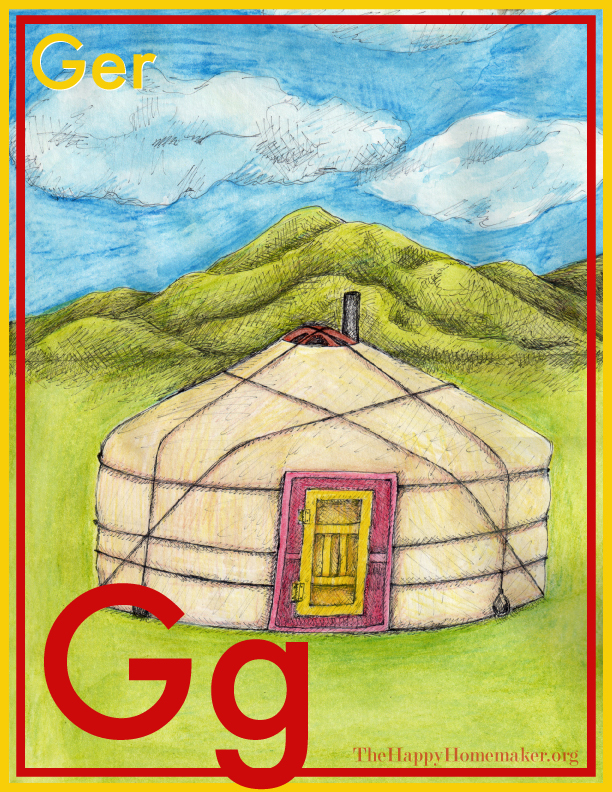 "What is the difference between a quinzhee and an igloo?" you might ask. (I know I did.) 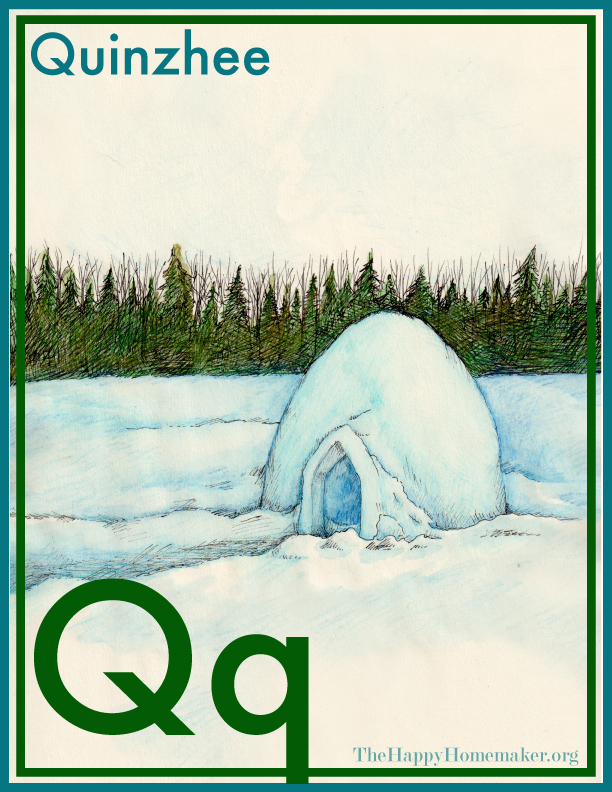 The answer is that a quinzhee is carved out of snow while an igloo is built from blocks of it. 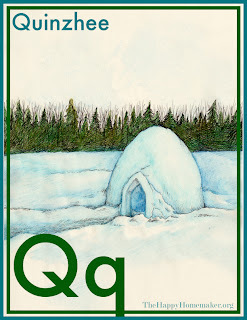 While igloos are a tradition of the Inuit, and are crafted in a specific manner, quinzhee are built and used in many places. Quinzee were even built in Princeton, New Jersey in the eighties. I remember my mom building them with me when I was wee. She would carve out a snow drift to make me a snow house and a snow couch and a snow bed ... The making was the fun part. What can I say? 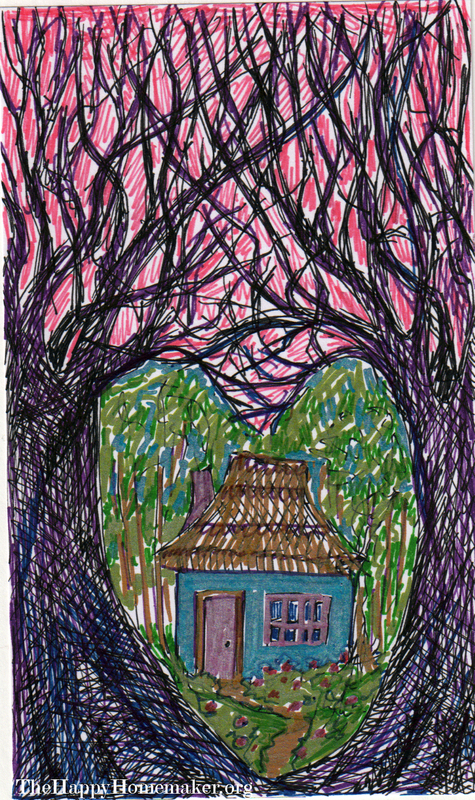 I liked making houses. Well, some things never change, do they? Native American Pueblo house complexes are modular, multiple story houses built out of adobe by the Pueblo Indians of the Southwest. (I, too, used Adobe products to lay out the design of this house, but my Adobe is software and not bricks made of baked clay and straw.) Each unit of these structures is similar to an apartment. Many times an extended clan live together in the Pueblo structure, and homes are passed on for many generations. 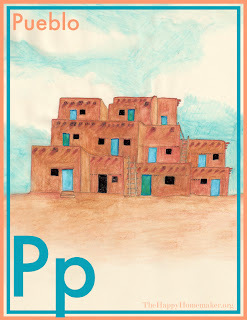 I love the way the doors of the Pueblo houses are often painted to match the sky. The combination of the colors of the sky and clay are exquisite. During the summer months in the Ariège region of France, shepherds in the Pyrénées mountains would practice transhumance, the leading of livestock to the high mountains, or estives, to support their herds on the pastures. 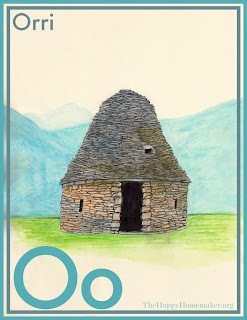 While in the estives, the shepherds camped in stone cabins called orris. The orris were built by hand without mortar and were generally furnished only with a bench for sleeping. It is amazing how long these huts have lasted in the Pyrénées. Many are still standing today. I think that orris must have been Peyo's inspiration for les maisons des Schtroumpfs, n'est-ce pas? 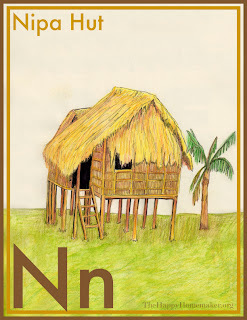 The Nipa hut, a pile dwelling structure constructed of bamboo, is the indigenous house of the Philippines. 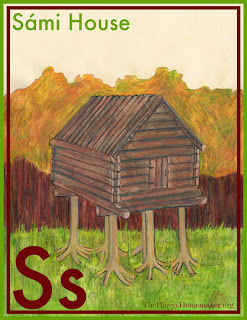 The stilts protect the house from flooding and animals, and they are often built over the water. The bamboo is naturally water resistant as well as prolific, making it easy and inexpensive to repair the houses. 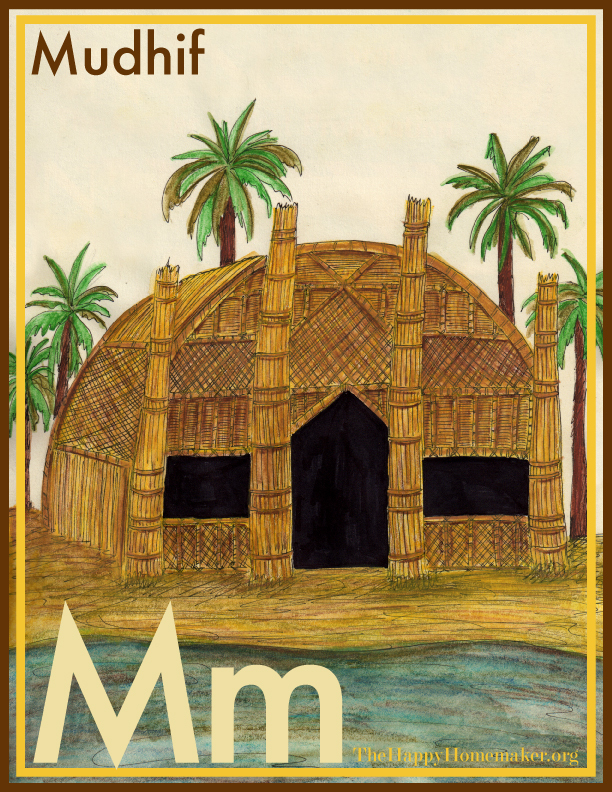 The Maʿdan, Shīʿite living in the Amara marshes in southern Iraq, build Mudhifs, houses intended for communal activities and as housing for guests and travelers. The buildings are constructed of giant reeds on a reed platform that provides structure above the waters of the marsh. 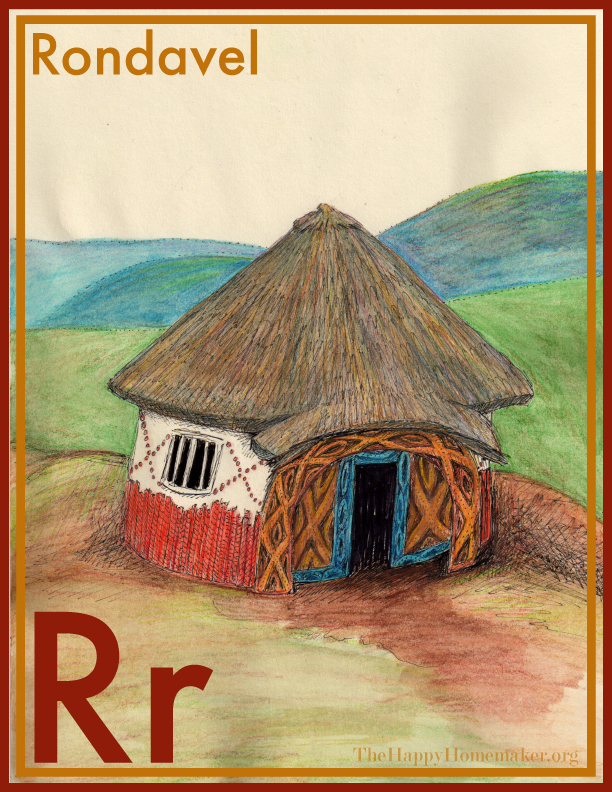 Viking houses were as rough and tumble as one might imagine. 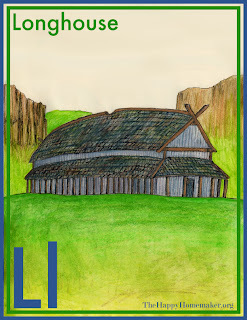 Generally, the longhouses were constructed as one large room. 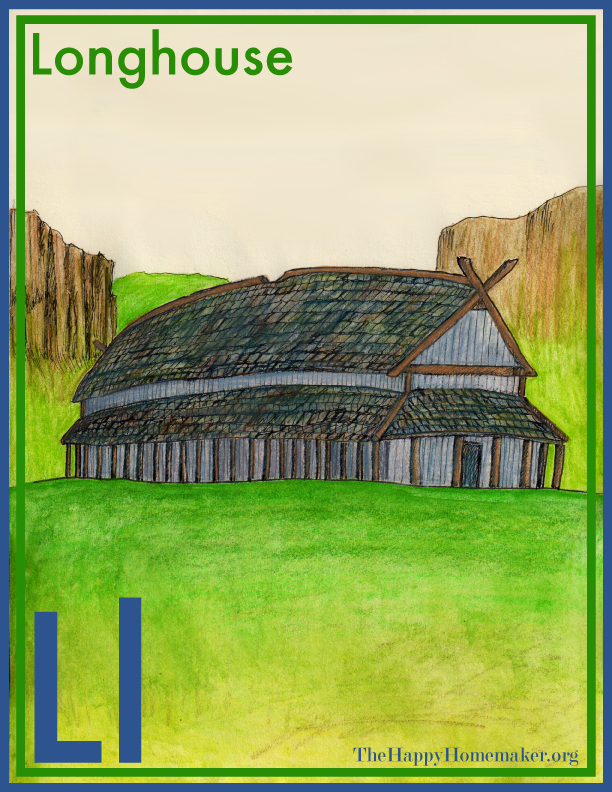 The structure was constructed of wood or peat blocks with wooden planks placed on the inside of the walls. Oftentimes the roof of the longhouse was covered with turf. Furs and skins lined the room to keep it warm. Frequently, one end of the structure was used as a barn. I think the structure resembles an overturned viking ship. Perhaps that is the way the building evolved. Or maybe the structure worked so well as a watertight vessel that it would be only natural to invert it to keep out the elements. Or maybe the building technique was just what they were used to. What do you think? 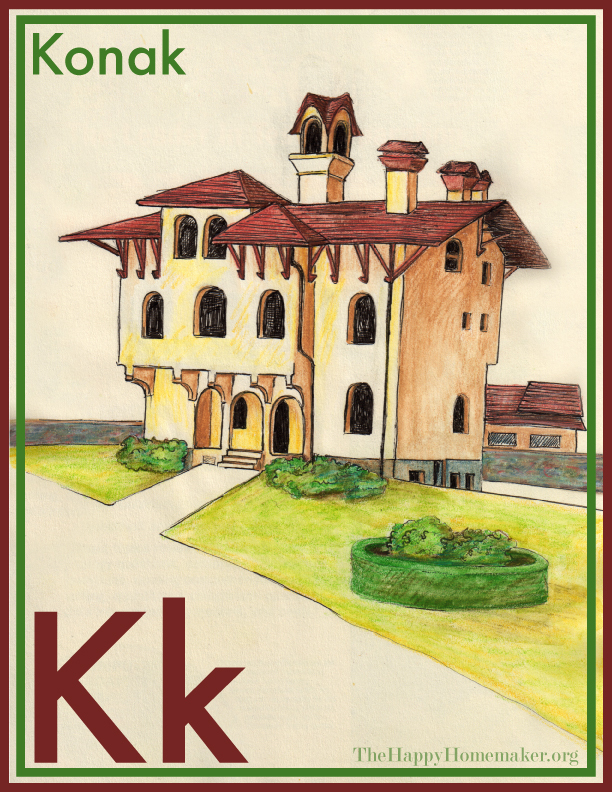 Konaks are sprawling houses in Turkey built during the rule of the former Ottoman Empire. Konaks are known for their extended, wooden soffits with dramatic woodwork, bay windows, painted ceilings, wooden domes centered on the roofs, and slit fenestration. An illustrated love letter to my husband, the literal happy homemaker in my life, who has been working very hard on our house. 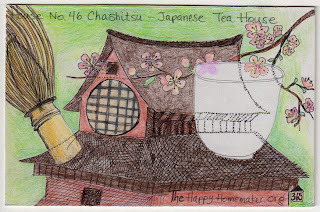 Yesterday, I received a mail art piece from my friend Mim. I was so excited! I was even more excited when I found out that Mim is also doing an alphabet series for her 365 project and started on nearly the same day that I did. So cool. I so enjoyed receiving art in the mail. I decided that my house today would be mail art to send back to Mim. 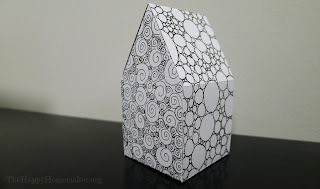 Well, I decided to make mail art for Mim, and it took so much time that I had to use it as today's house. I was just so into it. 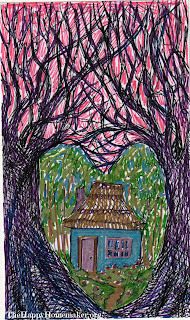 And I cannot believe that I had not used collage yet for a house. It's one of my favorite things to do. This card is made from a reused manila folder, a page from a Mexican calendar that I received with an order from Rancho Gordo, and lots of scribbling. 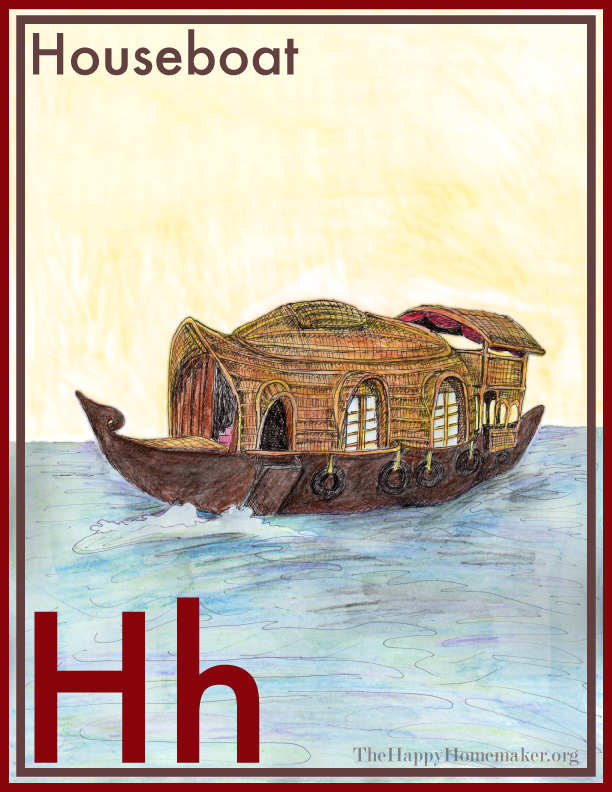 So, I have been detouring a bit from my alphabet, but I will be getting back to it soon. I just have a million ideas, and I cannot seem to stick to just one concept. nearly 6 in. x 4 in. This postcard is on its way to Carytown Teas in Richmond, VA. 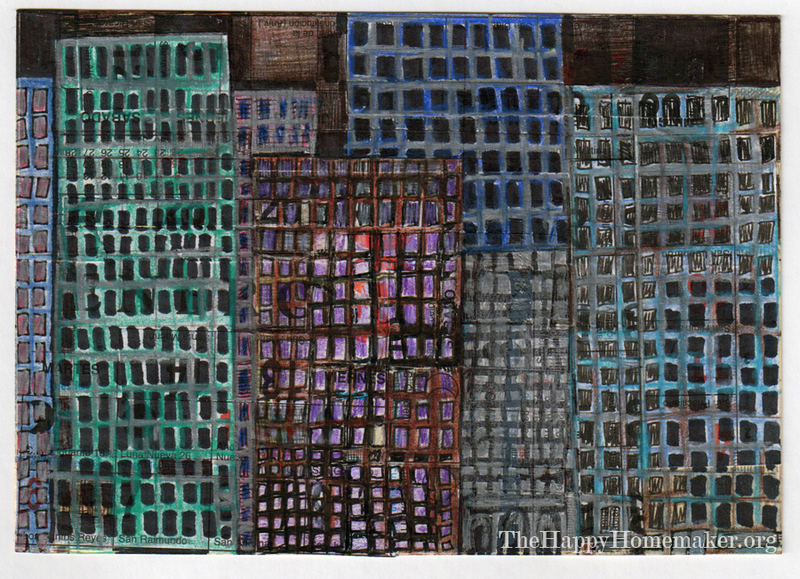 Learn more about their mail art collection, and send some of your own by visiting Mail Art Projects. The brush-looking thing on the left is a bamboo matcha whisk, and the background is the beautiful spring green of matcha tea. Happy Valentine's Day. My house today has a two-part back story. Part one: This evening, I took my VSU 2D Design class to Paint and Play to make decorative tiles. They have been working on an exhaustive series of square images on theses that they have chosen for the semester. 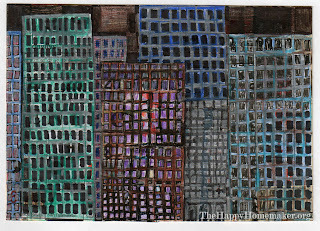 The tiles are meant to be a decorative study on the same theme that have the added benefit of a process (in this case, the firing) over which they do not have control. 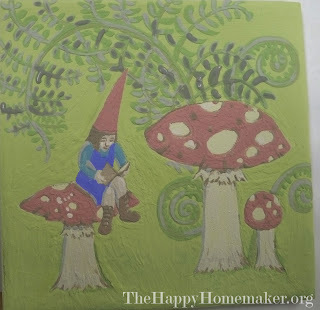 Since they have been working in relatively small square format, the tiles will fit in perfectly with the rest of their body of work. 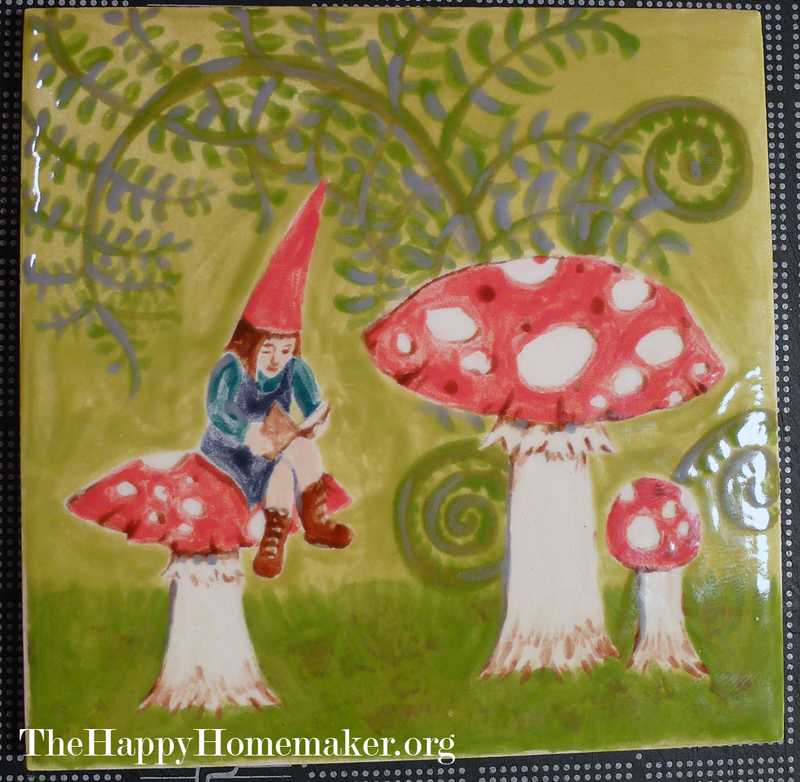 Part two: I am working on a series of tiles for the back splash in our soon-to-be kitchen. 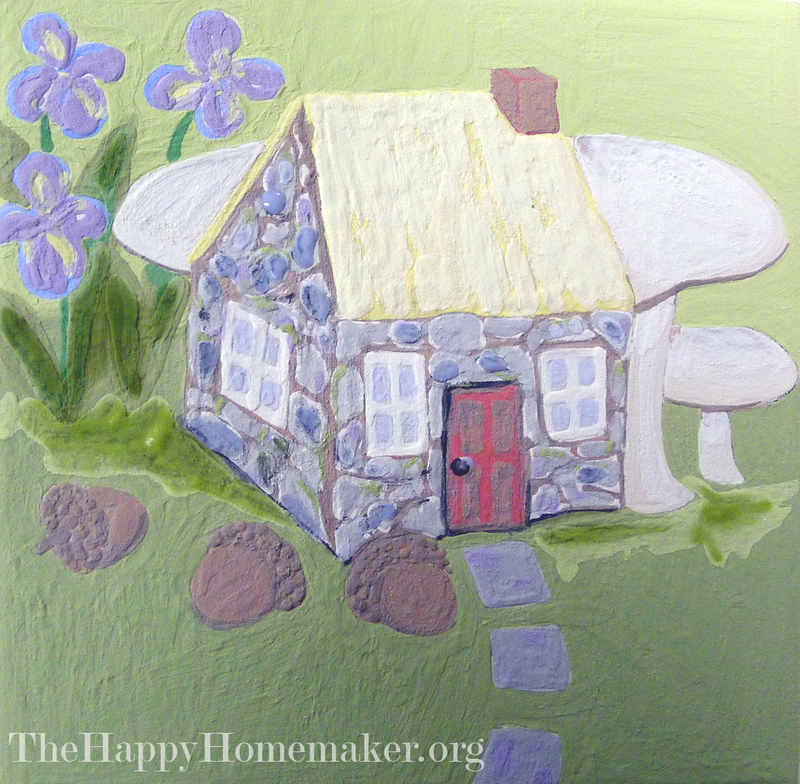 Today's house will fit in with the tiles. They do not really have a theme, per say, just things that I like and would want to look at while I spend time in the kitchen. 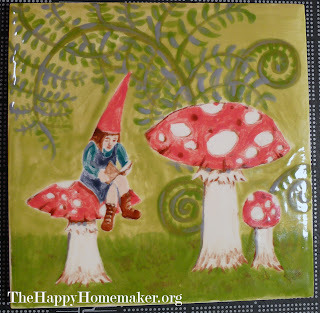 And guess what ... tonight, when I opened my Valentine's Day present from the werePanda, I found gift tiles to Paint and Play to make five more tiles. Pretty sweet. 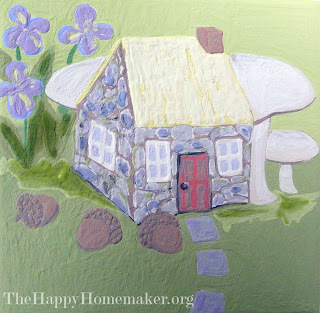 So today's little tile house will be a permanent fixture in our house, which is a whole project in itself. The pit dwellings of the Jomon era of Japanese prehistory which ranged roughly from 14,000–300 BCE. 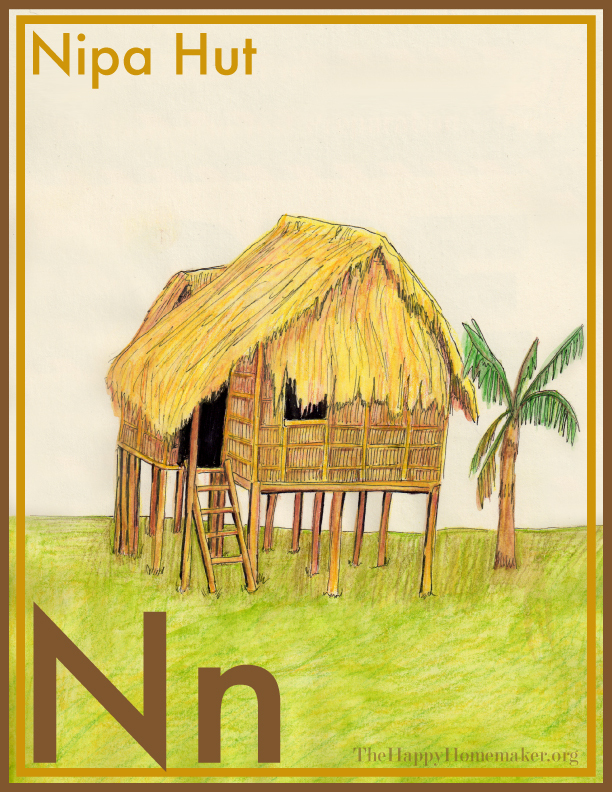 The houses were built of wood supports and thatch over a shallow pit. This is another example of the utilization of geothermal heating, similar to that of the earth berm. I think that it is fascinating to discover that humans worldwide often discovered and developed the same techniques and that often the basic use of natural resources are so effective that we revisit them now. Izbas are Russian log cabins built by peasants in the countryside. Many are ornately decorated with painted woodwork. The houses were built without saws or nails because the steel was so expensive. Instead, the logs were notched with a hand axe and fit together. Ornamentation was whittled by knife. 1.5 in. x 3 in. x 1.5 in. 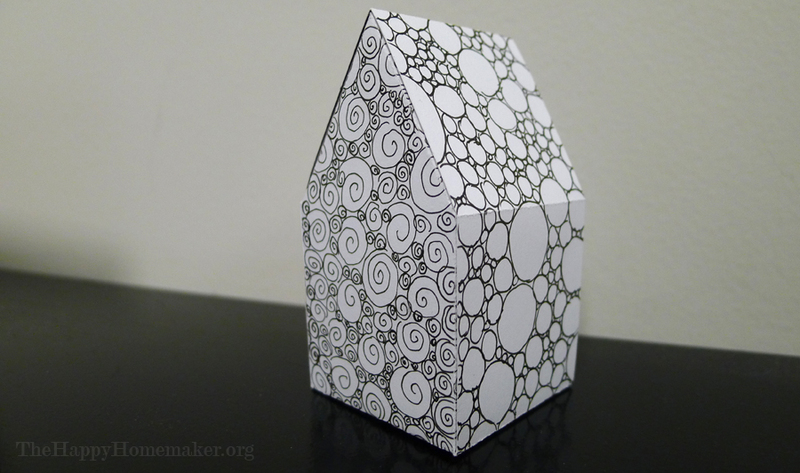 A black and white house because I wanted to draw circles with a fine tip pen today. Sometimes, you gotta just follow your impulses. 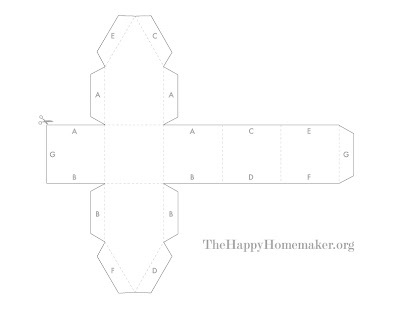 For you to use ... a square paper house template that I made and that I am using for today's post. 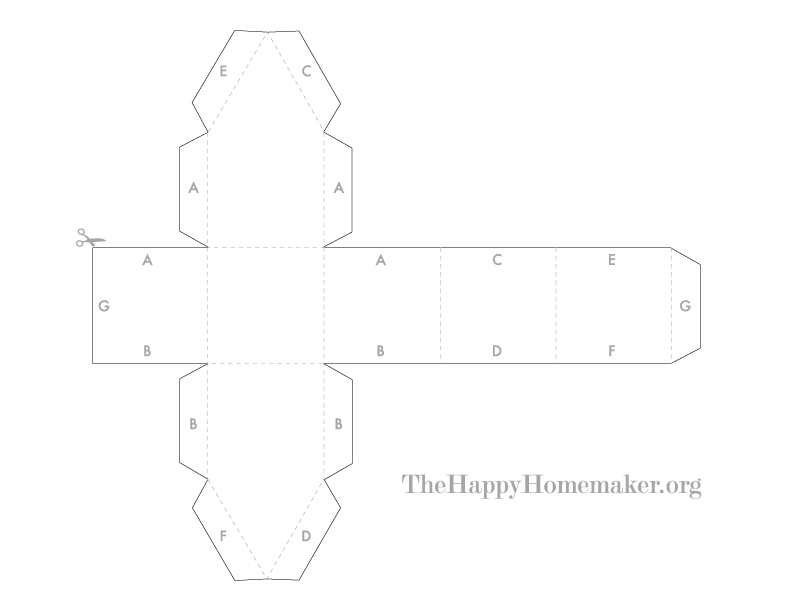 For best results, print on card stock and fold with folding instructions facing in, or cut it out and use it as a template or stencil to mark your final paper. If you create something with the template, please send a photo for me to post! 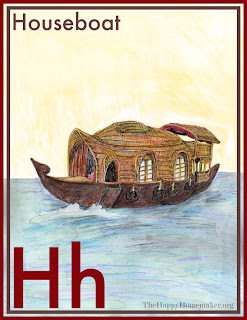 In Kerala, India, waterways are a major source of transportation, and the backwaters of Kerala may be cruised by houseboat. The boats are made with coir and bamboo and held together by knots. Some of the boats are up to one hundred year old. 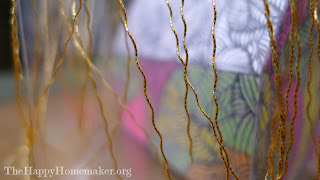 Many of the boats are very decorative and the coir is elaborately woven and appears delicate, looking almost like lace. What a romantic way to travel. Ger, the home of the nomadic Mongolians, are unquestionably the most luxurious in the history of mobile homes. Created with a wooden structure covered by fabric tarps and rugs, blankets, and skins to insulate the structure, they are lined with tapestries, heated, and furnished. This is not the kind of camping that you and I know. This makes even an RV look like squatting. While I have never seen a Ger in real life, there was an amazing facsimile of a Ger interior in the exhibition design of The Legacy of Genghis Khan: Courtly Art and Culture in Western Asia, 1256–1353, that I had the fortune of seeing at the Metropolitan Museum of Art in 2002. I could have moved in right there. The Mongol Empire, they knew how to travel in style. Off topic, that was likely the most beautifully designed exhibition that I have ever seen. And the artwork was amazing. I was lost in there for hours. I suspect the Ger may have been part of the inspiration for the set designers who created the tents in the Harry Potter films. Foursquare and ten dozen years ago, our homebuilders brought forth on this continent a new architectural style, conceived in simplicity, and dedicated to the Prairie School and Craftsman styles. 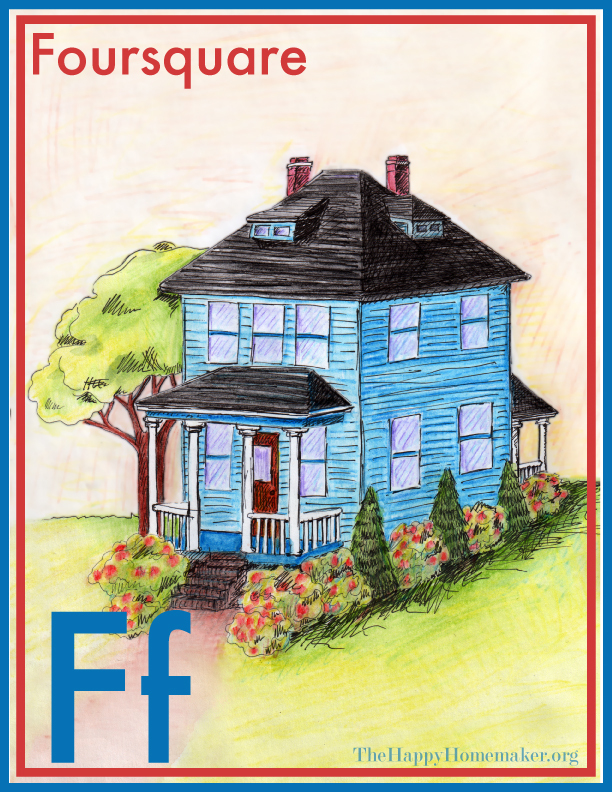 About as American as architecture comes, the Foursquare is sometimes referred to as the Transitional Pyramid. It was a widely popular style that was built extensively for over forty years in both the country and cities. Their construction increased even more when they were offered as kit houses in Sears catalogs. You still see them a lot today. 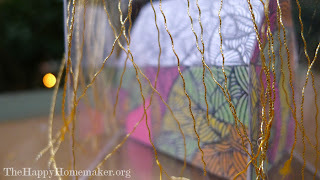 Today's house is a transatlantic collaboration piece done with Kirin of Illustrating Rain. The inspiration for the finished piece was the name of Kirin's site. 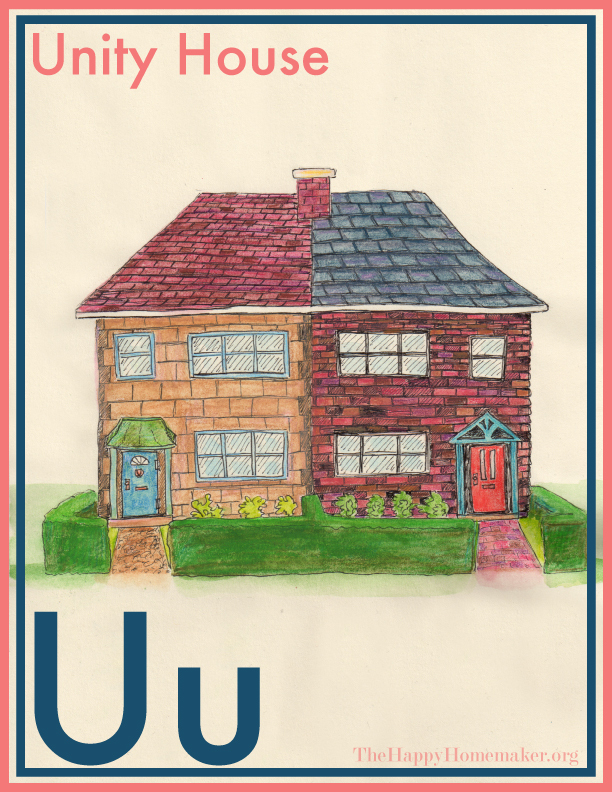 Here is how we collaborated separated by nearly 4,000 miles: I sent to Kirin a PDF template for a house, which, in turn, Kirin returned by email beautifully illustrated. 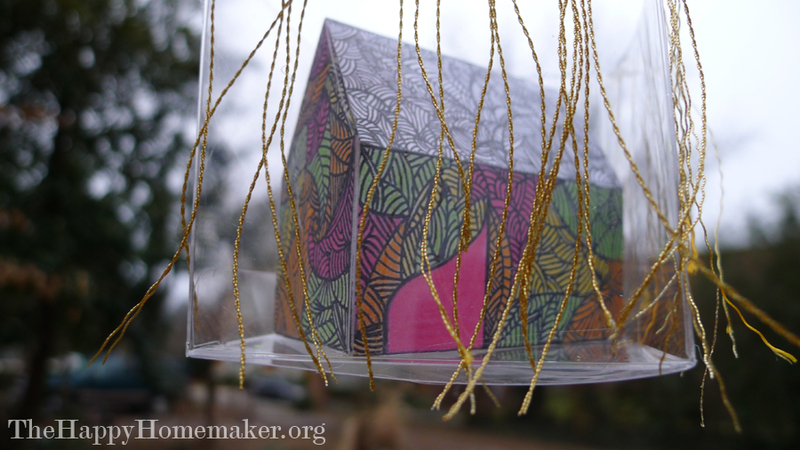 I printed and assembled the house, glued it into an upcycled plastic cube, glued separated gold thread around the top so that it would look like rain (That inspiration came from the French expression il pleut des cordes or Les cordes de pluie, which translate as it's raining cords and cords of rain. ), and photographed it in my backyard. It was a treat for me to work with such a talented and whimsical illustrator. Thanks, Kirin! 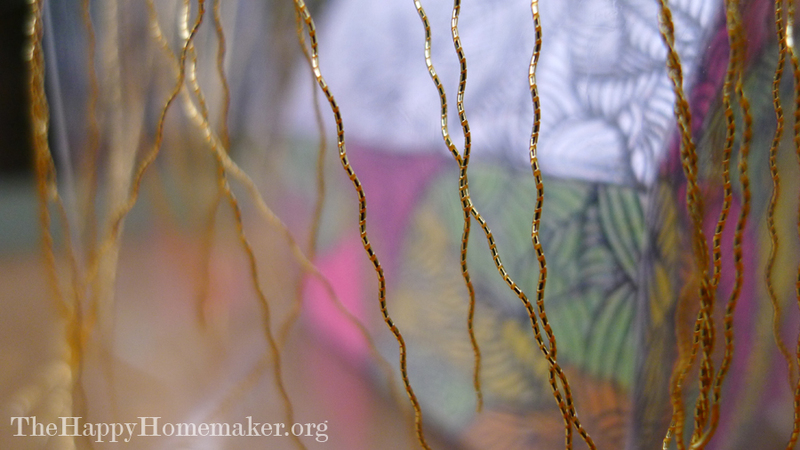 Please visit Kirin's 365 project site, In Animate Me for more terrific work.